ONE BY ONE, family members of nine slain black parishioners confronted Dylann Roof for the last time today. Some shouted at him, others offered forgiveness and to visit him in prison as he awaits execution for the mass shooting in South Carolina in 2015. Scott, an aunt of 26-year-old Tywanza Sanders, the youngest victim killed in the massacre, demanded that Roof look at her as she talked about her nephew’s “great big heart”, which could not be donated because of the police investigation. 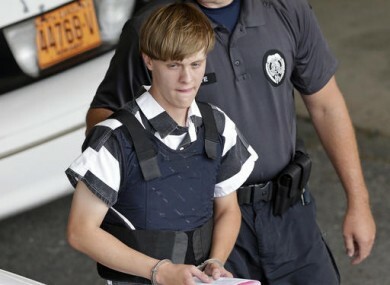 The final statements came a day after jurors sentenced an unrepentant Roof to death. The gunman had one final opportunity to ask for mercy but instead told jurors he still “felt like I had to do it”. Some family members already testified at Roof’s trial. The formal sentencing hearing gave 35 of them a chance to speak directly to him, without prosecutors or the judge interrupting or asking questions. Roof also had an opportunity to speak but declined to say anything. He is the first person ordered to be executed for a federal hate crime. Some of the relatives looked directly at Roof. Others chose to look at jurors, who did not have to be in court today but told the judge they wanted to attend. Sheila Capers, the sister-in-law of Cynthia Hurd, said she prayed for Roof’s soul to be saved. “If at any point before you are sentenced and you’re in prison and you want me to come and pray with you, I will do that,” Capers said. Felicia Sanders, who survived the attack, said she forgave Roof, repeating comments she made after the shooting. But, she noted, Roof did nothing to save himself. He served as his own attorney during the sentencing phase and never explained the massacre, expressed remorse or asked for his life to be spared. Sanders brought the bullet-torn, bloodstained Bible she had with her on the night of the mass shooting, 17 June 2015. She told Roof he still lives in her head, and that when she hears a balloon pop or fireworks, it returns her to that night. “Most importantly, I can’t shut my eyes to pray,” Sanders said. On the night of the shooting, Roof sat through a 45-minute Bible study session at the black church known as Mother Emanuel with 12 others. He opened fire as they stood and closed their eyes for a final prayer. In all, he fired 77 shots. Each victim was hit at least five times. Three people survived. Roof told one of them he was sparing her life so she could tell the world he was killing the worshippers at the Emanuel African Methodist Episcopal Church because he hated black people. The willingness of some of the relatives to forgive the gunman was widely discussed in the days after the killings. But that did not mean they all felt his life should be spared. And there are others who said forgiveness is still a work in progress. “You are Satan. Instead of a heart, you have a cold, dark space,” Gracyn Doctor, the daughter of DePayne Middleton-Doctor, said, expressing hope that Roof would “go straight to hell”. When he was arrested, Roof told FBI agents he wanted the shootings to bring back segregation or perhaps start a race war. Instead, the slayings had a unifying effect as South Carolina removed the Confederate flag from its Statehouse for the first time in more than 50 years. Other states followed suit, taking down Confederate banners and monuments. Roof had posed with the flag in photos. The jury convicted Roof last month of all 33 federal charges he faced. He insisted he was not mentally ill and did not call any witnesses or present any evidence. Roof, who also faces murder charges in state court, plans to appeal the federal case. Prosecutors say he will remain jailed in Charleston until the state charges are resolved. No trial date has been set. Email “'Go straight to hell': Victims' families confront mass murderer Dylann Roof ”. Feedback on “'Go straight to hell': Victims' families confront mass murderer Dylann Roof ”.